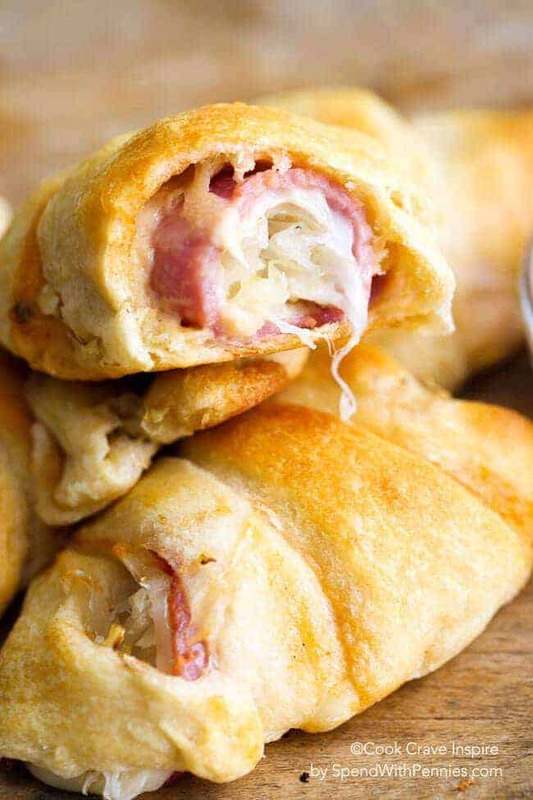 Reuben Roll Ups! 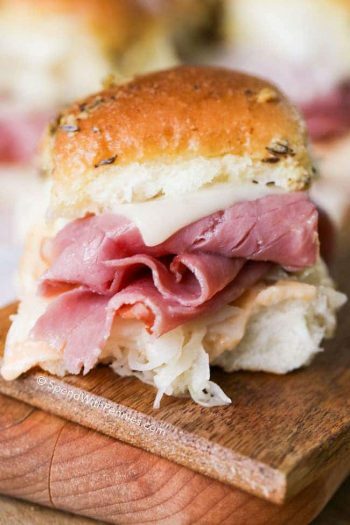 All of the deliciousness of a reuben sandwich in an easy to make roll up! 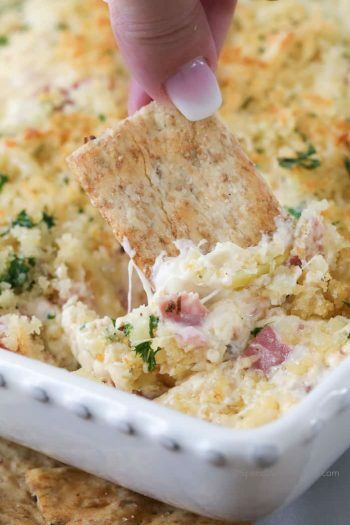 Perfect for snacks, appetizers or lunch! 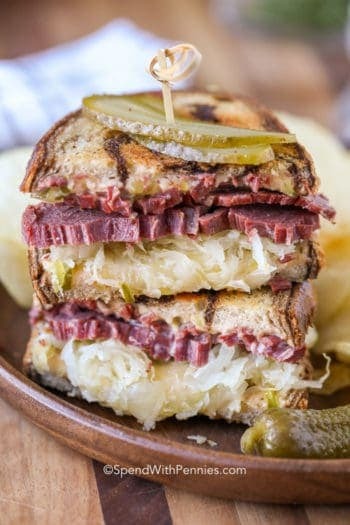 One of my husband’s favorite sandwiches is a Reuben! It’s easy to see why, delicious corned beef and sauerkraut loaded with melty hot swiss cheese. Doesn’t that just sound like a little piece of heaven! 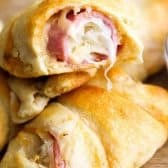 I came up with these quick and easy Reuben Roll Ups as a delicious snack to serve when we had guests but they’re perfect for lunches too! The best part is they take only about 5 minutes of prep. When purchasing corned beef for these rolls, ask the deli cut the slices a little bit thicker so you only need 1 slice per roll. If your corned beef is a little bit thinner, you may need to add a few slices. I cut the beef and the cheese diagonally into triangles for the perfect fit! If you’d like to prepare these ahead of time, roll them as directed, place them on a parchment lined pan and cover lightly with plastic wrap. Remove them from the fridge while the oven is preheating and bake as directed. Unroll and divide the crescent rolls. 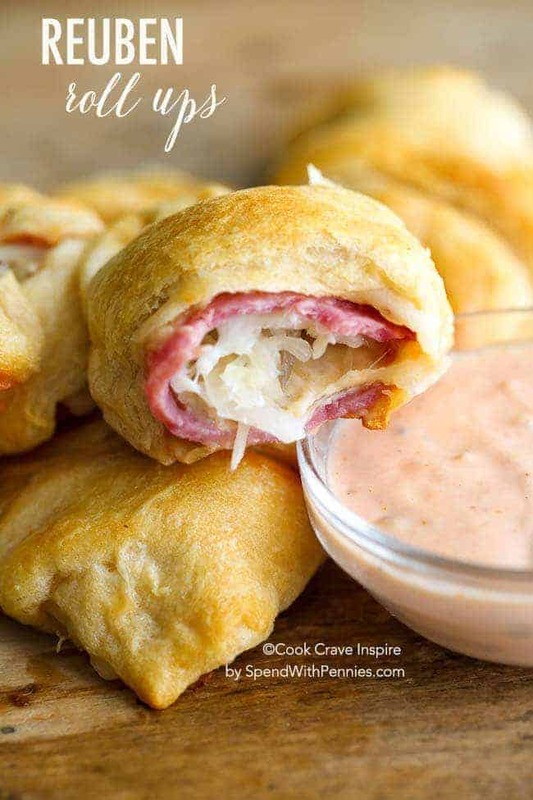 On each roll, place 1 tablespoon sauce, 1/2 oz corned beef, 1/2 oz cheese and 2 tablespoons sauerkraut. Roll up and place on a parchment lined pan. Do you cook the corn beef before wrapping them? I bought the meat in the meat section at the super market prepackaged, I’m unsure I want to make sure the meat is cook correctly!! 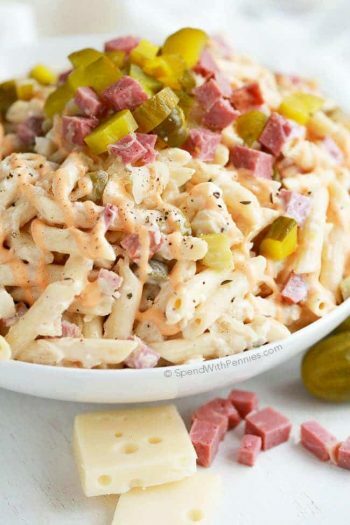 The corned beef is pre cooked in this recipe. Hi Holly – can these roll up’s be prepped 24 hours in advance or will they become soggy? 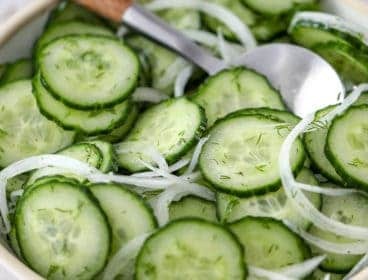 Is it better to prep a few hours before? Just trying to figure out timing ;-) Thanks! I haven’t tried prepping them in advance, but I think it would work if you prepared them, refrigerated then baked them when you need them. You may need to increase the baking time a little. Let us know how it works out for your Jen! I’m not real sure how you roll these up? Do you do it according to the package instructions? They do look so good. Did anyone try freezing them? There is a video just above the recipe which should help you with the rolling. 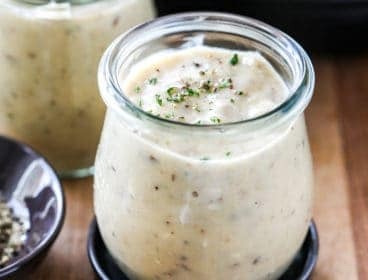 I make the sauce to dip with thousand island and horseradish. It is amazing. Try it!!! OMgosh, my husband would love that, we both love horseradish! Thank you for sharing! Looks delicious. Too bad I can’t find a way to save to my Pinterest. Can you update your site to include that option? Frustrating. Right under the first photo is a red pin it button, I hope this helps! Could you substitute another cheese for the Swiss, something a little milder like provolone or something? For sure you could, that would be delicious! I love corn beef and swiss cheese. 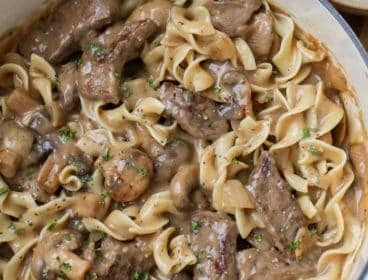 I’m looking for different menu variations for Thanksgiving instead of turkey. 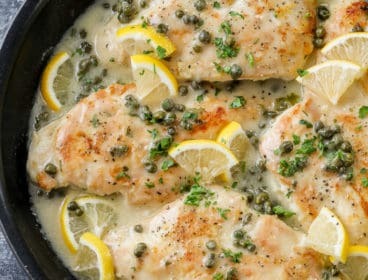 I’m trying this with various menu sides. 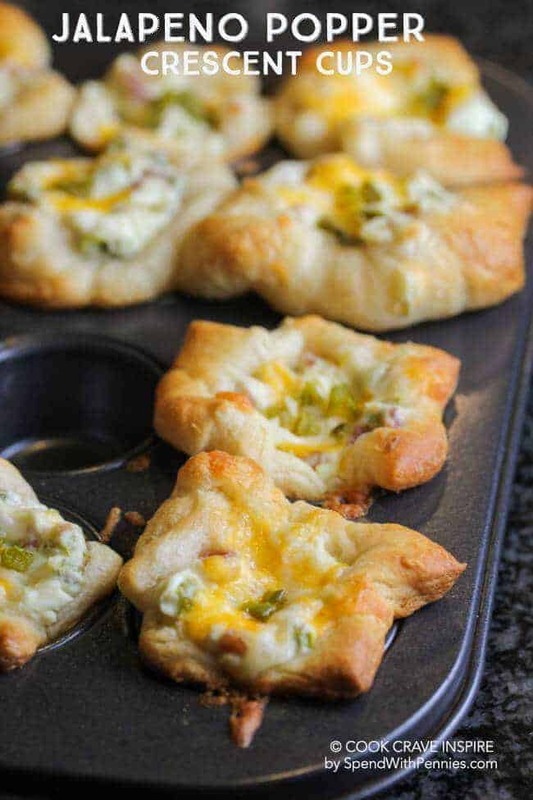 Making these tonight. I can not wait!!! You can also buy saurkaret with caraway seeds in it. That’s how we make our German pork chops with saurkaret. Susie where did you get your sauerkraut with the caraway seeds, I live in Massachusetts and haven’t come across these as of yet . Thank you for letting me know these exist. What are crescent rolls? It looks similar to croissant dough. Yes Stonkingbonkers. It’s the same dough. Credentials rolls are sold in tube in refrigerator section of a US grocery store. They are so quick and handy that people have forgotten how to make croissant dough. I made these today for a get together. I would suggest dicing the cheese & cutting the corned beef in strips. The one tablespoon of dressing was actually a little too much for my rolls so I ended up just drizzling some in the rolls. How do you think these would be if I froze them after putting them together? Would like to have something like this ready for a quick meal/snack. I haven’t tried freezing them. I think the best option would be to prebake them and cool completely and then freeze them. Please let us know how it works out for you. 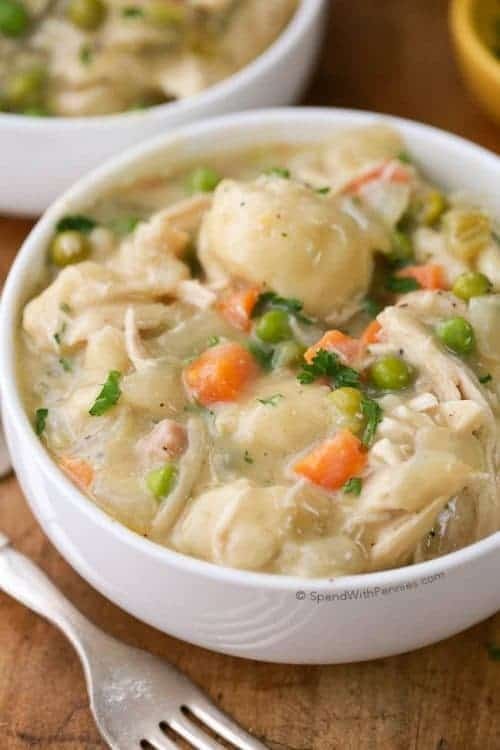 Wondering if you tried freezing them and how it went. I would like to do that too. Thanks for the info! I made these rolls after purchasing all the ingredients. I found that the #1 important ingredient may be purchasing the original Pillsbury Crescent Rolls. I bought an off-brand when in a hurry shopping and we all agreed the rolls were not very tasty. Also, my use of sauerkraut was too little. Advise to follow the recipe using a flakier roll. On the Reuben Roll Ups it says to use 1 TBS of sauce on each ………… I am assuming that means the thousand island dressing …… ? Yes, the sauce is the thousand island dressing. 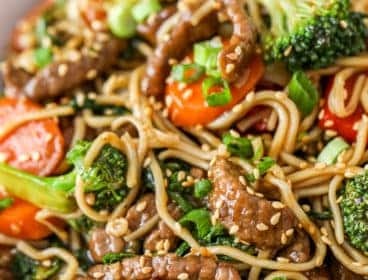 These look SO good and SO easy. 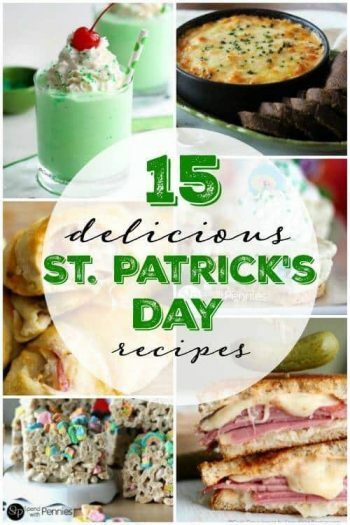 I must make them for an appetizer to our St. Patrick’s Day feast! Thank you Megan! 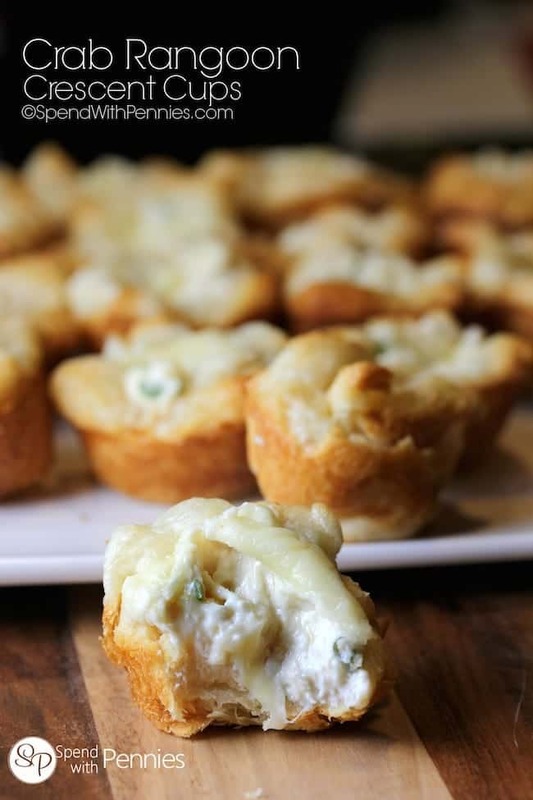 These do make a great appetizer! 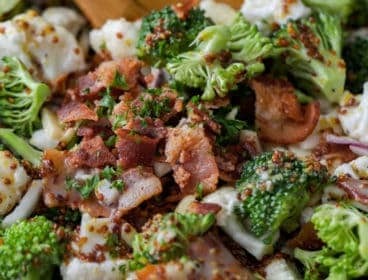 Great easy lunch option! Love how creative you get with a few easy ingredients!! Thank you Kathryn! They’re definitely one of our favorite lunches! What a clever idea! I bet they’d be a hit at any party – can’t wait to try them! These little babies look amazing! 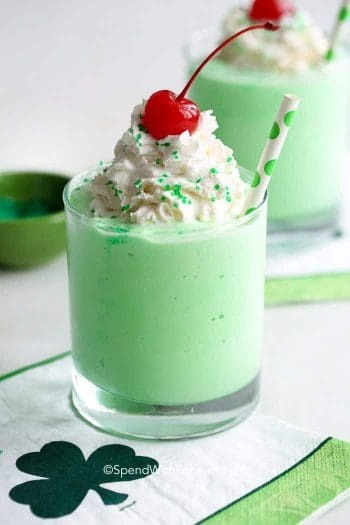 They are just perfect for my St. Patrick’s Day menu! Thanks so much for sharing!! I think I will give this a try but maybe add an egg or butter wash then sprinkle with some caraway to get the rye flavor of the traditional sandwich. The caraway would be an amazing addition!! These looks so amazing! I love Reuben sandwiches more than life itself! I can’t wait to try these. They were so good Kathleen, I think I could’ve eaten them all myself!